The Neolithic Period began when new settlers arrived from Europe, bringing with them a time of great change for the hills. One of the most significant advances in this era was the development of sophisticated tools which were made from flint found in the limestone of the hills. 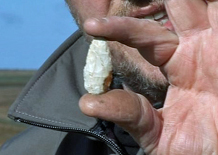 A Neolithic flint factory has been excavated at the front of the Black Mountain. Flint finds include a knife, a javelin-head, barbed and tanged arrowhead and a scraper. These new settlers were the first farmers and they cleared entire sections of the uplands to make space for permanent settlement and cultivation. It is thought that some regularly used burning to clear vegetation, which changed the soil and made it more waterlogged and acidic. This eventually gave us the upland heath and blanket bog we have today. Neolithic people buried their dead with great care in stone tombs. 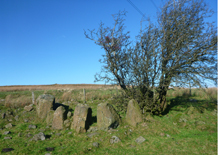 A fantastic example of such a court tomb is located on McIlwhan’s Hill and is known locally as the Hanging Thorn Cairn. Rarer still are stones engraved with cup and ring marks at important Neolithic ritual sites.